To prove our confidence in the products we provide and it's value to you, we are offering a 30-day, money-back guarantee-No questions asked! Want to travel but concerned about seasickness and carsickness? Want to enjoy the sights from a mountain but altitude sickness just kills your desire? Want to experience Virtual Reality but worried about dizziness? Nausea and vomiting are common symptoms for many people while driving or traveling by cars, boats, or airplanes, and for many women who are pregnant and experience morning sickness. While many people take medicines to contrast those symptoms, some people choose to endure them because they do not want to experience the negative side effects of the medicines, which may at times be even worse than what it is meant to treat. Then, our bestselling EmeTerm is definitely for you! No drug, no risk, no worries about potential side-effect. EmeTerm is a proven, safe and effective drug free anti-nausea relief band that prevents and relieves nausea and vomiting induced by motion sickness (while riding a car, a boat, or a plane) and morning sickness (during pregnancy). The product is designed to meet the IP65 rating, making it completely dust-proof and water-resistant. 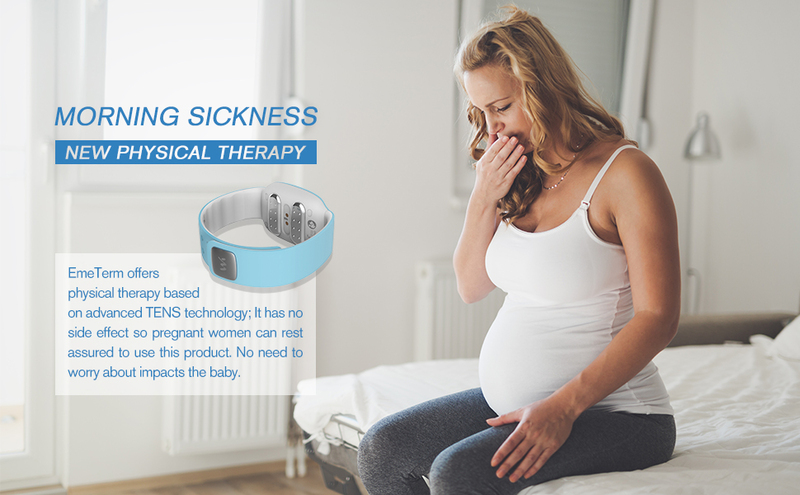 The band is made with hypo-allergenic material and the device is equipped with specialized electrodes that maximize the electrical conductivity. The product also magnetically charged for convenience and lasts up to nine hours per charge. Download the Brochure. Clinically Proven for Vomiting and Nausea. Patented Ergonomics Designs, no Conduct Gel Needed. Convenient and Low Allergy. 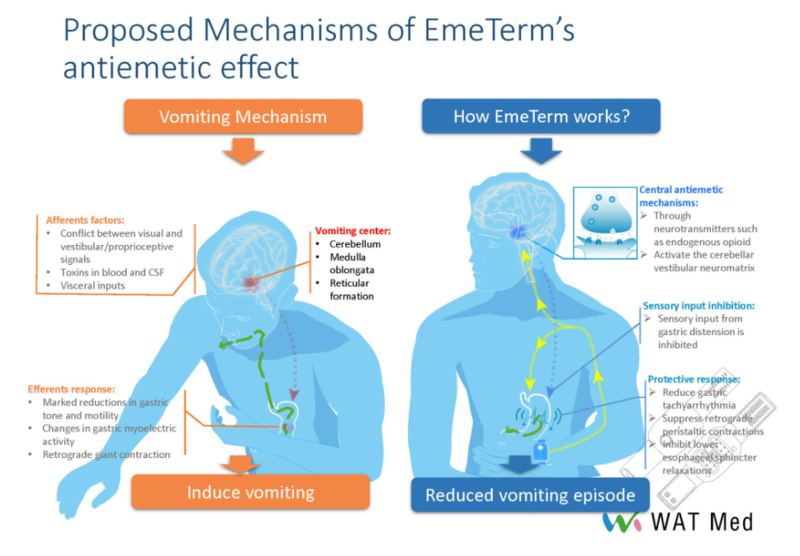 The anti-nausea and vomiting wristband- EmeTerm uses electric impulses to stimulate targeted vomiting central in the brain, and precisely blocks the signal of nausea and vomiting from brain to stomach. 1. It is essential to cleanse and de-grease the skin and electrodes thoroughly before the treatment to ensure a good quality skin-electrode interface. Use cleansing wipes to cleanse and de-grease the wrist skin. 2. Under low temperature and low moisture climate (e. g. winter), it is recommended to start the treatment at least 10 minutes before experiencing nausea. 3. It is recommended to change to the other wrist after 30 minutes using for the users who are used in a humid environment or have allergic skin. 2. The EmeTerm device is indicated for the treatment of nausea and vomiting in patients 6 years of age or older. 3. Please consult with your physician if you have a cardiac pacemaker or implanted defibrillator, other implanted metallic and electronic device near the working device. Nausea and vomiting are caused by transmission of a nausea signal to the stomach via the human brain, which causes the stomach to contrast irregularly, resulting in vomiting. By releasing a low-frequency pulse with a particular frequency, EmeTerm can adjust the vagus nerve signals traveling to and from the stomach, and can prevent or postpone the brain from transmitting nausea signals to the stomach. This then slows down the irregular gastric contraction, and reduces the nauseous sensation for the users. TENS stands for Transcutaneous Electrical Nerve Stimulation. It consists of a small unit, attached to the head via electrode pads, through which a harmless electrical signal is passed. The sensation is not painful or unpleasant, and can be likened to "pins and needles", or even gentle massage. Nausea and vomiting are caused by transmission of a nausea signal to the stomach via the human brain, which causes the stomach to contrast irregularly, resulting in vomiting. By releasing a low-frequency pulse with a particular frequency, EmeTerm can adjust the vagus nerve signals traveling to and from the stomach, and can prevent or postpone the brain from transmitting nausea signals to the stomach. This then slows down the irregular gastric contraction, and reduces the nauseous sensation for the users. 1. EmeTerm attached to the wrist via electrode pads, delivers signal through the median nerve at the location on the underside of the wrist. 2. These signals travel through the body's nervous system to the part of the brain which controls nausea, which causes the stomach to contrast irregularly, resulting in vomiting. 3. By releasing a low-frequency pulse, it can adjust the vagus nerve signal traveling to and from the stomach, and can prevent or postpone the brain from transmitting nausea signals to the stomach, then reduces the nauseous sensation for the users. For dry skin, there is no problem. If you have especially sensitive skin, Switch between left and right hand every 15-20 minutes if necessary. EmeTerm is a drug free, none-invasive, devices that uses electrical stimulation technology to prevents and relieve morning sickness. By releasing a particular low-frequency electrical pulse from the user's wrist, EmeTerm™ adjusts the vagus nerve signals traveling to and from the stomach. This signal prevents or postpones the brain from transmitting nausea signals to the stomach. These pulses slow down the nausea-inducing irregular gastric contraction, and reduces the nauseous sensation for the users. Morning sickness affects 70-80% of all pregnant women. About 60% of them experience nausea and vomiting. Morning sickness can decrease pregnant women's work efficiency, resulting in unnecessary healthcare expenses, and negatively impact the quality of life of both the mothers and the unborn child. EmeTerm is a safe alternative to relive morning sickness for expectant mothers. Many modern medications used today have low risk factors but often still present with debilitating side-effects. First review I have ever written so bare with me. I had hyperemesis gravidarum with my first pregnancy. I’m now in my second pregnancy, and as every mother who has been through HG. Being pregnant again makes your anxiety go through the roof. This time round the sickness kicked in at 4 & 1/2 weeks and went a week before putting the wrist band on. Soooo glad I didn’t wait any longer !!! I’m no longer extremely nauseated and vomiting. Now it’s very low rated nausea where it’s fine for me to still eat, drink and take care of a toddler. Highly rate this product! Only thing that can be frustrating is trying to clip the band on. I bought this as I was willing to try anything to combat my morning sickness. I was going to try it out and would have returned it had it not worked. Although I'm happy to say I feel like it has helped, it's not a 100% cure for me, my morning sickness is not totally gone, but its definitely more manageable. I haven't actually been sick since I started using it and I'm not gagging in the mornings either. I use the wrist band with a few other strategies that overall have reduced my morning sickness down to mild to moderate nausea. I started on the lowest setting and slowly built up as its says in the instruction book now I can use it at level 3 and can barely feel the pulses. Its easy to use, high quality, well made and holds its charge very well. Best pregnancy investment we’ve made to date! I don’t know what I would do without this device. I couldn’t stand upright before it came, due to severe morning sickness. While the sickness is not gone and some days/hours are worse than others, I can usually walk upright now and complete tasks without interruption. It’s still early, but we are very pleased. At times, the contact area needs to be made moist before it works on my wrist. As someone who gets motion sick in a lift or even just 15 minutes in a car and recurrent labyrinthitis I decided to try this. Well I am amazed! I managed a bumpy plane journey followed by an hour in a car and nothing! My stomach didn't turn over at all. I felt completely fine! I would thoroughly recommend this product and am excited for more adventures now I don't have motion sickness holding me back! I do a lot of travelling by coaches and have always suffered from motion sickness. I have tried the little button wrist bands, medication, traditional chinese medicine, the lot. To be honest, I was a bit wary at first to spend such a large amount on this product but in the end it was well worth it. The instructions are fairly simple and I could feel the symptoms of motion sickness lessening after a few minutes. Amazingly after 10 minutes, car sickness gone! I lent this to my older brother as he also suffers from motion sickness (guess it runs in the family). He also has said the symptoms are gone after 15 minutes of use. So after getting cancer for the second time at 32, my biggest fear was the chemotherapy, the smallest mention of it sent chills down my spine, and why? Because of the sickness. It was a constant feeling, and it wasn't until day 7 that would I start to feel better, slowly, knowing I had to do it again a week later. So when I was told that I would have to go through it all again for 6 months. I was so scared, well, petrified. And sure enough the first course of the new chemo hit me like a ton of bricks, and to top it off I was even more sick, and for longer this time. So, desperate, I looked online for something to help, I put into Amazon "anti sickness" and this came up, and thank God I did, and I thought "hey, it's worth a try", also knowing I could probably return it if it didn't work. So there I was at my 2nd course of chemo, with this band on my wrist and........nothing, 6hrs later my 2nd course of chemo had completed, and......nothing, I got back, and later that night.......nothing......no sickness, no dizzy feeling. Used it to travel back and forth to Spain. A very bad traveller normally..Had no problems at all even though landing home was rocky. Only problem is strap.. hard to clip in place.. I like playing VR games very much. Unfortunaly, I usually feel vertigo. It really had a big impact on me and I don't like this feeling. But now I can devote myself to VR games and feel no vertigo any more since I bought the EmeTerm. It’s amazing. At the beginning, the wristband was not very easy to wear. But I can put it on easily when I tried several times. To be honest, it is a minor shortcoming, but it is still an amazing product. I'm going to recommend this amazing wristband to my friends. I have had two hyperemesis gravidarum pregnancies. HG for me meant vomiting at least 40 times a day, in and out of hospital, throwing up large amounts of blood, tearing holes in my esophagus, acute kidney failure,ketosis,anaemia, low blood pressure...etc i was advised after my 2nd pregnancy not to have anymore children....despite all my efforts to not get pregnant again i find myself 7 weeks into my 3rd pregnancy....desperate to find a solution to my sickness i typed in anti sickness and this came up....i read the reviews and was skeptical but willing to try just about anything. So far the only times i feel sick is when i take it off to charge, i dont really write product reveiws often but this definitely deserved a mention as its managed to do what odansetron and all the other drugs couldnt.